As we're sure you're aware, nothing excites us here at MusicRadar like a bit of music-making innovation, particularly when it's going on right on our doorstep. Last month we met up with new Bristol-based hardware developers nu-desine, a small company started with help from Bristol's Media Sandbox initiative. The company are currently in the process of developing their first instrument, the AlphaSphere, and we were curious to take a look. The AlphaSphere is a spherical, pad-based tactile instrument that utilises MAX MSP software and can interface with MIDI devices. The surface of the instrument is covered with 48 pads that respond to pressure to trigger samples or control parameters such as pitch, volume and oscillation. We spoke to nu-desine founder Adam Place to find out some more. "It's based on an original concept I had when I was studying in Japan," Adam tells us. "Really it's about bringing electronic production away from computers and back to an instrument that anyone can play. "We've gone through quite an intensive five month process of looking at different materials and different ways of developing this. Eventually we found the ideal material [for the AlphaSphere's pads]. It was originally developed for robotics about five years ago, but no one ever found a proper application for it." nu-desine currently has one working prototype of the AlphaSphere, and at this stage is looking for musicians to get involved by providing feedback and support (which is where our trusty MusicRadar community - i.e. you lot - come in). "We're just interested in what people think about this, where it can go, that's the kind of development process that is going to happen. "We're sure musicians like those reading this have got some input and we really want that involved in the developmental process. We really want to see what you make of it and what you think could happen." 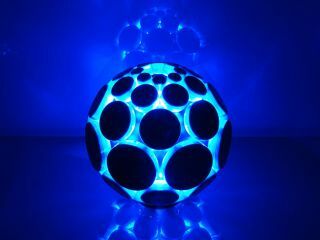 Check out their video below to get a better look at the AlphaSphere and visit nu-desine's IndieGoGo site to read about how they're looking for support. "I think there are a number of people who are going to be interested in using the AlphaSphere," Adam tells us, "developers, musicians who want to get involved in the programming of synthesisers and sound design. "But I also think it's going to bring musicians who are more classically instrumentalists towards electronic sounds and electronic music and I think that's really exciting. We'll see what happens, but I see the AlphaSphere as something that could unite the two. "The next step for nu-desine and the AlphaSphere is to get more funding to develop this further. We want to get this out there to people and start taking it around and develop a limited run to kind of test the waters. "We want to see who might be interested in getting hold of one and having a go with it, building a community of developers and musicians who will be instrumental in the development."